It's the end of their last high school year, and Elizabeth and Lauren are going to be roomates at Berkeley in California in the fall. The start of their cross-cuntry email exchange coincides with the start of a summer that will be momentous for both. The pink and green work exceedingly well together (they're much softer in real life than this image makes them seem), and the casual line-drawn illustration style will likely have a wide appeal. Safe choice in the sans serif font, too, with the tagline in a contrasting cursive font. 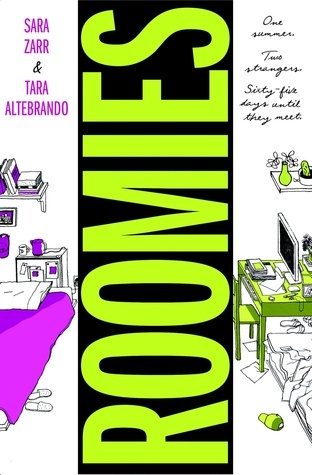 Roomies is the type of novel that stumps all my efforts to write a professional, at least semi-objective review. This book has all the ingredients for a heartwarming and potentially thoughtful contemporary bildungsroman, but somehow it left me feeling vaguely unsettled and disappointed. Perhaps it's the very fact that the book contains all the typical ingredients. With two co-authors exchanging very brief, quick chapters, it's difficult to get any sense of style to distinguish the story from a generic YA contemp. The same goes for the voice of our two protagonists, and it's easy to confuse Elizabeth's and Lauren's lives. 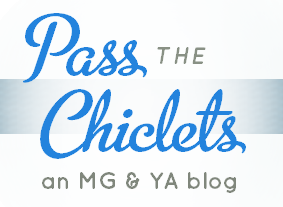 As with most YA contemps, the plot is driven mostly by character interactions and the consequences that derive from them. The pace is brisk as Lauren and Elizabeth jump from character to character, so Roomies doesn't drag, at least. It's also lightly sprinkled with humorous and feel-good moments, perhaps enough to satisfy the casual reader. Anyway, personally, Roomies wasn't a good fit for me. I will reserve judgement before saying "not recommended" to anyone else. Ethnic balance: 2.5 out of 5. Good job for trying, I guess.